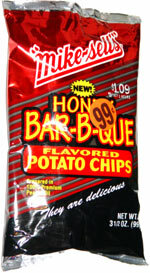 Taste test: These are good barbecue chips with a mild, sweet taste. There's no heat to them at all, either in the initial taste or the aftertaste. The chips are slightly thicker than most conventional potato chips, but not nearly as thick as some other peanut oil-based chips, such as Tim's. They have a nice crispness to them, and some of the chips in the bag were fairly large. Smell test: Nice barbecue aroma, with a vague honey kick to it.